30 Geziret El Arab St.
Long gone are the days when Sushi was a rare delicacy found in only a limited number of exclusive spots around Cairo restaurants. Now, it has become ridiculously commercial with sushi places popping up everywhere – some even named almost identically. With its increased availability and abundance of all-you-can-eat promotions, sushi restaurants have inevitably decreased in quality. One of the first brands to launch the sushi concept in Egypt was Mori Sushi, and with a bit of caution, we revisited the Mohandessin branch in hopes of finding it still retaining its prestige. The restaurant hasn’t changed its décor, which is anything but worn out, and the black, grey and orange modern Asian theme is still pretty much pristine. The place is moderately sized and boasts a few tables, as well as an open kitchen in the back. We were immediately greeted by a friendly waiter who led us to our spotless table, that already had all the cutlery laid on it; quite a lovely and professional touch. Our menus were laid out instantaneously, and as always, they were well-organised and looked quite posh. The sushi menu is pretty much the same as it has always been; brimming with endless options of Nigiri, Ura Maki, Dynamite and Hot Tempura rolls as well as Sashimi options amongst many others. The grill menu, however, did feature a few new items including a couple of burgers, and some delicious-sounding chicken dishes such as the Brazilian Chicken Thighs (60LE). Our order was served in a surprising few minutes despite its intricacy. Our sushi platters looked picturesque as always and tasted absolutely fresh. Our absolute favourite rolls were the Pink Panther Roll (39LE/ 4 pieces), the Kiwi Rainbow Roll (39LE/4 pieces), and the Crispy Shrimp and Avocado Roll (40LE/4 pieces). The real surprise, however, was the grill section. The Rib Eye steak (95LE), drenched in Wild Mushrooms Sauce (9LE) was heavenly, and grilled to our requested medium-well. The Sizzled Chicken Breasts (60LE), which consisted of chicken chunks drenched in Soy Sauce and seasoned with various peppers, was also quite delectable despite being quite scarce in its size. Its side of vegetable rice was also bursting with flavour. Our waiter continued to be quite helpful, amicable and never out of sight. Our empty dishes were not left lingering on our table, but were removed in a flash. In a nutshell, Mori Sushi has successfully managed to avoid the pitfalls of most sushi restaurants nowadays. While the novelty of sushi has long worn off, Mori has been able to maintain a level of quality and service unlike any other restaurant. While the rolls were expensive, they were equally delicious, and the grill section exceeded every expectation we had. Leave room for some dessert and a refreshing drink, since they have quite alluring options that we regret not trying. Everything from the taste and quality of the food to the service and overall cleanliness of the place was on-point. 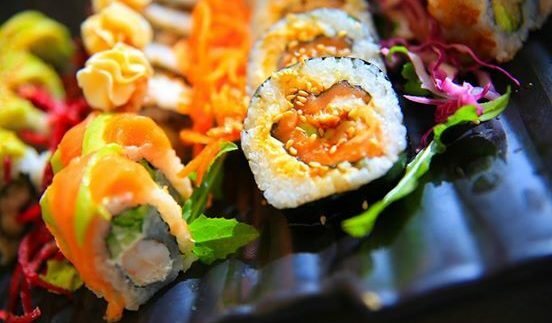 Sushi rolls are, at the end of the day, quite expensive- especially if you can scoff down 20+ rolls in one sitting.